It’s that time of year again. Your healthcare providers and pharmacists are gearing up for flu season. What does gearing up look like? Well, we know the devastation the flu can cause, but many people choose not to get vaccinated, sometimes because of faulty information they’ve read online or heard from others. So we see it as our job to bust myths about this lifesaving vaccine. Here’s what the flu feels like: It comes on suddenly. One day you’re fine, the next day you feel like you were hit by a truck. Your whole body hurts. You have a high fever, cough, headache, sore throat and fatigue. It typically lasts a week — unless you have complications, in which case it lingers longer. And if you have vomiting and diarrhea, you most likely have a viral stomach bug, which is different from the flu. Only occasionally does the flu cause vomiting, and even then it’s more common in children. But diarrhea is not part of the picture with the flu. The flu shot doesn’t help with stomach bugs. I wish it did! The flu shot is a killed virus vaccine, and, as such, can’t cause the illness it is meant to protect against. It’s a different story for the influenza nasal spray vaccine, which uses a live-attenuated or weakened form of the flu virus — so it shouldn’t be given to anyone with a suppressed immune system because it could give them influenza. Flu season typically lasts from November until April, some years running as late as May. Because it takes two weeks for the flu shot to work, we want to get vaccinated before flu season begins. You’re not protected against the flu until those two weeks are over. But if you end up not being able to get the flu shot until later, don’t distress. It will still offer protection for the remainder of the flu season. Even though the flu shot is the best guess for which strains are circulating that particular year — based on which strains have hit the southern hemisphere, since their flu season comes before ours — it still protects you from serious complications of the flu. Some year’s vaccines are better than others, but that doesn’t mean the vaccine isn’t worth getting. The national Centers for Disease Control (CDC) found that of all the pediatric deaths caused by influenza during the 2012-13 flu season, 90 percent were not vaccinated against the flu. It’s also worth noting that since 1938, when the flu vaccine was introduced, we haven’t seen a flu pandemic. The 1918 Spanish flu pandemic killed nearly 50 million people worldwide. Maybe. But even healthy people can have serious complications from the flu — pneumonia, respiratory failure, death. It’s true that those with chronic illness, the elderly, infants and pregnant women are at the greatest risk. But of those pediatric influenza deaths from 2012-13, 40 percent had no chronic illness or other risks for serious complications. You are more likely to have serious consequences from the flu than from the other infections for which we more readily vaccinate. In 2015, we had our first measles-related death in more than a decade. By contrast, the CDC estimates between 9.2 and 35.6 million cases, 140,000 to 710,000 hospitalizations, and 12,000 to 56,000 deaths from the flu in the United States annually. Good news. As of the 2016-17 flu season, the CDC now recommends the flu shot for everyone, even those allergic to eggs. If you can eat cooked eggs without difficulty or have a milder version of an egg allergy, you can get a flu shot at any location. If you have a serious egg allergy, you can still get the flu vaccine but need to have it administered by a physician who can recognize and respond to a severe allergic reaction. As for mercury, there is none in the flu shot unless you are receiving a vaccine drawn from a multi-dose vial. And even then, the amount of mercury in one pediatric dose is equivalent to eating one three-ounce can of tuna — and it’s a much less harmful form of mercury (ethyl mercury rather than methyl mercury). 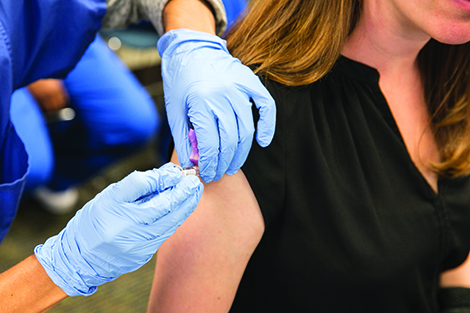 MultiCare Health System offers flu shots for adults and children at a wide range of locations throughout the Puget Sound and Inland Northwest regions. Pharmacies that offer the flu shot typically accept most forms of insurance, but be sure to let your primary care doctor know you received your flu shot so it can be added to your record. Don’t let faulty information stop you from getting a flu shot. That’s the advice of medical experts. is a family medicine provider for MultiCare Health System’s Rockwood Clinic. MultiCare is a not-for-profit health care organization with hospitals, clinics and services in the Puget Sound region and eastern Washington. Log in | 49 queries. 2.337 seconds.